nonprofit organization that gives suits to high school graduates of color in Chicago and New York. 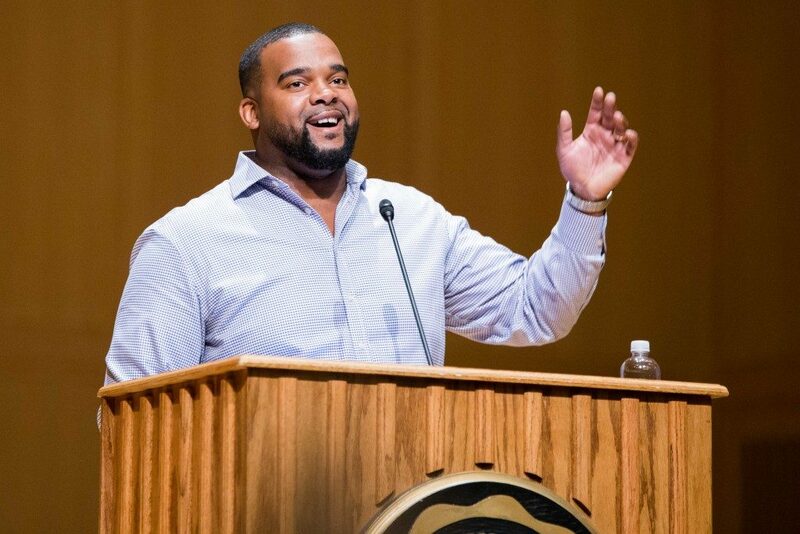 Former WGRE DJ and DePauw student council vice president, Charles Kuykendoll ‘09, welcomed the Class of 2020 to campus as part of the GOLD Alumni Speaker Series. Kuykendoll is a Senior Recruiter and Vice President of Suit Dreams, a non-profit working toward changing national perception of urban males, sought to inspire the freshman class to actively participate in their college careers. “DePauw is still a place where anything is truly possible,” said Kuykendoll before he launched into the possibilities DePauw allowed him to create for himself since he stepped foot on campus in the summer of 2004. Kuykendoll cited his Friday night radio show with his friends at WGRE 91.5 as one of the catalysts for him realizing the opportunities, not only within DePauw, but beyond campus. Kuykendoll told a story of when a prisoner from the local jail wrote in to tell how the opportunity to listen to the show gave him a genuine escape from his current situation. Kuykendoll then asked the Class of 2020 how they would use their newfound freedom, leverage their time, and how they would translate these experiences into achieving their dreams. “These next four years are going to be an opportunity for you to experience life like you never have before,” said Kuykendoll. Kuykendoll explained after spending time on-campus as a first-year, his dreams expanded and grew to ideas he could have never imagined a few months ago, but, made clear these ideas and opportunities are not handed to you. He spoke about the importance of thinking critically about what he or she wants, design a game plan, and leverage your results. Kuykendoll these opportunities help gain a foothold on a dream were in the clubs he participated in, but the true difference, for him at least, was made inside the classroom. “You have the best professors who have office hours who enjoy leading, speaking, and even assisting students outside the classroom,” Kuykendoll said. Kuykendoll then went onto explain the change students would see in themselves four years from now. Kuykendoll’s speech strongly resonated with freshman and mentors alike. “I just thought that it was really good experience seeing someone share their experience during their time at DePauw knowing that they were in the same shoes as me and seeing how far they’ve come and grown,” said Junior Tendai Hinds.